Solubility is defined in terms of the maximum mass of a solute that dissolves in 100g of solvent. The mass depends on the temperature. For example, the solubility of sodium chloride (NaCl) in water at 25⁰C is about 36g per 100g of water. The solubility of solids changes as temperature changes. This can be plotted on a solubility curve. The salts shown on this graph are typical: the solubility increases as temperature increases. For example, the graph above shows that in 100g of water at 50⁰C the maximum mass of potassium nitrate (KNO₃) which will dissolve is 80g. However, if the temperature were 80⁰C a mass of 160g of potassium nitrate (KNO₃) would dissolve in 100g of water. At a chosen temperature (e.g. 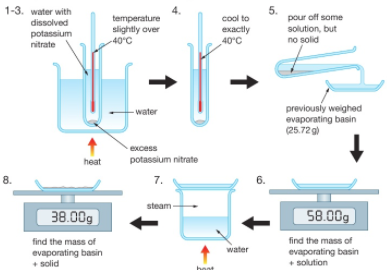 40⁰C) a saturated solution is created of potassium nitrate (KNO₃) for example. Some of this solution (not any residual solid) is poured off and weighed. The water is then evaporated from this solution to leave a residue of potassium nitrate which is then weighed. The difference between the two measured masses is the mass of evaporated water. The solubility, in grams per 100g of water, is equal to 100 times the mass of potassium nitrate residue divided by the mass of evaporated water. Pure substances, such as an element or a compound, melt and boil at fixed temperatures. However, mixtures melt and boil over a range of temperatures. Example: although pure water boils at 100⁰C, the addition of 10g of sodium chloride (NaCl) to 1000cm³ of water will raise the boiling point to 100.2⁰C. 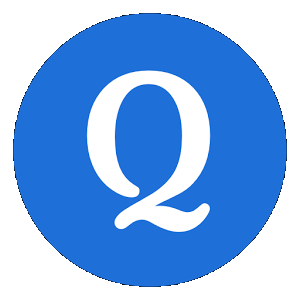 Example: although pure water melts at 0⁰C, the addition of 10g of sodium chloride (NaCl) to 1000cm³ of water will lower the melting point to -0.6⁰C. This method is used to separate a liquid from a solution. For example: separating water from salt water. The salt water is boiled. The water vapour condenses back into a liquid when passed through the condenser. The salt is left behind in the flask. Note: cold water is passed into the bottom of the condenser and out through the top so that the condenser completely fills up with water. This method is used to separate a mixture of different liquids that have different boiling points. For example, separating alcohol from a mixture of alcohol and water. Water boils at 100oC and alcohol boils at 78oC. 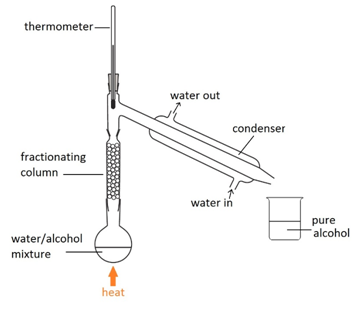 By using the thermometer to carefully control of temperature of the column, keeping it at 78oC, only the alcohol remains as vapour all the way up to the top of the column and passes into the condenser. The alcohol vapours then condense back into a liquid. This method is used to separate an insoluble solid from a liquid. For example: separating sand from a mixture of sand and water. The mixture is poured into the filter paper. The sand does not pass through and is left behind (residue) but the water passes through the filter paper and is collected in the conical flask (filtrate). This method is used to obtain a salt which contains water of crystallisation from a salt solution. For example: hydrated copper sulfate crystals (CuSO4.5H2O(s)) from copper sulfate solution (CuSO4(aq)). Gently heat the copper sulfate solution in an evaporating basin until a hot saturated solution forms. Leave in a warm place to allow the hydrated copper sulfate crystals to form. Remove the crystals by filtration and wash with distilled water. Dry by leaving in a warm place. If instead the solution is heated until all the water evaporates, you would produce a powder of anhydrous copper sulfate (CuSO4(s)). This method can be used to separate the parts of a mixture into their components. For example, the different dyes in ink can all be separated and identified. The coloured mixture to be separated (e.g. a food dye) is dissolved in a solvent like water or ethanol and carefully spotted onto the chromatography paper on the baseline, which is drawn in pencil so it doesn’t ‘run or smudge’. The paper is carefully dipped into the solvent and suspended so the baseline is above the liquid solvent, otherwise all the spots would dissolve in the solvent. The solvent is absorbed into the paper and rises up it as it soaks into the paper. The choice of solvent depends on the solubility of the dye. If the dye does not dissolve in water then normally an organic solvent (e.g. ethanol) is used. As the solvent rises up the paper it will carry the dyes with it. Each different dye will move up the paper at different rates depending on how strongly they stick to the paper and how soluble they are in the solvent. Paper chromatography can be used to investigate the composition of a mixture. A baseline is drawn on the paper. The mixture is spotted onto the baseline alongside known or standard reference materials. The end of the paper is then put into a solvent which runs up the paper and through the spots, taking some or all of the dyes with it. Different dyes will travel different heights up the paper. The resulting pattern of dyes is called a chromatogram. In the example shown, the mixture is shown to contain the red, blue and yellow dyes. This can be seen because these dots which resulted from the mixture have travelled the same distance up the paper as have the red, blue and yellow standard reference materials. 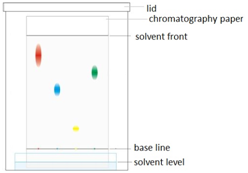 When analysing a chromatogram, the mixture being analysed is compared to standard reference materials by measuring how far the various dyes have travelled up the paper from the baseline where they started. If the Rf value of one of the components of the mixture equals the Rf value of one of the standard reference materials then that component is know to be that reference material. 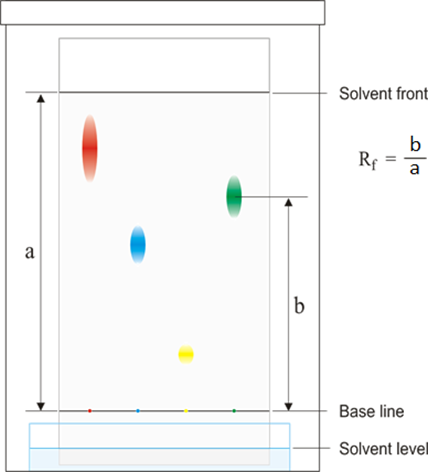 Note that because the solvent always travels at least as far as the highest dye, the Rf value is always between 0 and 1. Dyes which are more soluble will have higher Rf values than less soluble dyes. In other words, more soluble dyes move further up the paper. The extreme case of this is for insoluble dyes which don’t move at all (Rf value = 0). The other aspect affecting how far a dye travels is the affinity that dye has for the paper (how well it ‘sticks’ to the paper). A pencil line (baseline) is drawn 1cm from the bottom of the paper. Pencil will not dissolve in the solvent, but if ink were used instead it might dissolve and interfere with the results of the chromatography. A spot of each sample of dye is dropped at different points along the baseline. The paper is suspended in a beaker which contains a small amount of solvent. The bottom of the paper should be touching the solvent, but the baseline with the dyes should be above the level of the solvent. This is important so the dyes don’t simply dissolve into the solvent in the beaker. A lid should cover the beaker so the atomosphere becomes saturated with the solvent. This is so the solvent does not evaporate from the surface of the paper. When the solvent has travelled to near the top of the paper, the paper is removed from the solvent and a pencil line drawn (and labelled) to show the level the solvent reached up the paper. This is called the solvent front. The chromatogram is then left to dry so that all the solvent evaporates. Common solvents are water or ethanol. The choice of solvent depends on whether most of the dyes are soluble in that solvent. Metal oxides, metal hydroxides and ammonia (NH₃) are called bases. Bases neutralise acids by combining with the hydrogen ions in them. Acids are a source of hydrogen ions (H⁺) when in solution. When the hydrogen in an acid is replaced by a metal, the compound is called a salt. The name of the salt depends on the acid used. For example if sulfuric acid is used then a sulfate salt will be formed. A base is a substance that can neutralise an acid, forming a salt and water only. Alkalis are soluble bases. When they react with acids, a salt and water is formed. The salt formed is often as a colourless solution. Alkalis are a source of hydroxide ions (OH⁻) when in solution. A carbonate is a compound made up of metal ions and carbonate ions. Examples of metal carbonates are sodium carbonate, copper carbonate and magnesium carbonate. When carbonates react with acids, bubbling is observed which is the carbon dioxide being produced. If the acid is in excess the carbonate will disappear. Metals will react with an acid if the metal is above hydrogen in the reactivity series. When metals react with acids, bubbling is observed which is the hydrogen being produced. If the acid is in excess the metal will disappear. A base is a substance that neutralises an acid by combining with the hydrogen ions in them to produce water. A base usually means a metal oxide, a metal hydroxide or ammonia. Alkalis are bases which are soluble in water. Apart from this and other group 1 oxides (such as potassium oxide) most other metal oxides are not soluble in water. All the solutions produced here contain hydroxide ions (OH⁻) so they are all alkalis.